The following summary of planned new and on-going road improvements over the coming week is correct as of 29 January 2015 but could be subject to change due to weather conditions or unforeseen circumstances. All our improvement work is carried out with the aim of causing as little disruption as possible. The carriageway will be closed in both directions from 9pm on 1 February to 6am on 2 February. A diversion route will be clearly signposted. There will be a full 24-hour closure on the southbound entry slip from 2 February to 1 August. A diversion route will be clearly signposted. The southbound entry slip road will be closed from 2 February to 30 July. A diversion route will be clearly signposted. The southbound entry and exit slip roads will be closed from 9.30pm on 2 February to 6am on 3 February. A diversion route will be clearly signposted. The southbound carriageway will be closed from 2 to 12 February between 8pm and 6am. A diversion route will be clearly signposted. The westbound exit slip road will be closed from 10pm on 1 February to 6am on 2 February. A diversion route will be clearly signposted. The carriageway will be closed in both directions from 2 February to 13 May between 9pm and 6am. A diversion route will be clearly signposted. The carriageway will be closed in both directions from 2 to 15 February between 8pm and 6am. A diversion route will be clearly signposted. The eastbound carriageway will be closed in both directions from 2 to 8 February between 8pm and 5.30am. A diversion route will be clearly signposted. The carriageway will be closed in both directions from 2 to 28 February between 10pm and 6am. A diversion route will be clearly signposted. The northbound carriageway will be closed from 8pm on 2 February to 6am on 3 February. A diversion route will be clearly signposted. 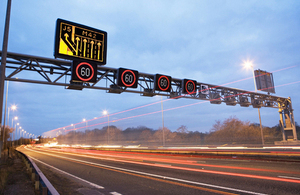 Generally, over the period of the scheme, temporary speed limits will be in place monitored by average-speed cameras. There is now a 40mph limit on the A45 Stonebridge Highway, A46 Coventry Eastern Bypass, A45 London Road and Tollbar Roundabout. Drivers are advised to follow any diversions and not to use their Satellite Navigation Systems. Planned traffic management for the week from Saturday 31 January (All lane and road closures during off-peak hours, 9:30am to 3.30pm and 8pm to 6am). Saturday 31 January – A45 (Stonebridge) Eastbound lane closure; A45 (Stonebridge) Westbound lane closure; A45 (Stonebridge) Eastbound lane closure; A45 (Stonebridge) Westbound lane closure. Sunday 1 February – A45 (Stonebridge) Eastbound lane closure; A45 (Stonebridge) Westbound lane closure; A45 (Stonebridge) Eastbound lane closure; A45 (Stonebridge) Westbound lane closure. Monday 2 February - A46 Southbound lane closure; A45 (London Road) Eastbound lane closure; A45 (Stonebridge) Eastbound lane closure; A45 (Stonebridge) Westbound lane closure; Rowley Road lane closure; Siskin Drive lane closure; A46 Northbound Road Closure; A45 (London Road) Eastbound lane closure; A45 (Stonebridge) Eastbound lane closure; A45 (Stonebridge) Westbound lane closure. Tuesday 3 February - A46 Southbound lane closure; A45 (London Road) Eastbound lane closure; A45 (Stonebridge) Eastbound lane closure; A45 (Stonebridge) Westbound lane closure; Rowley Road lane closure; Siskin Drive lane closure; A45 (Stonebridge) Eastbound lane closure; A45 (Stonebridge) Westbound lane closure. Wednesday 3 February - A46 Southbound lane closure; A45 (London Road) Eastbound lane closure; A45 (Stonebridge) Eastbound lane closure; A45 (Stonebridge) Westbound lane closure; Rowley Road lane closure; Siskin Drive lane closure; A45 (Stonebridge) Eastbound lane closure; A45 (Stonebridge) Westbound lane closure. Thursday 4 February - A46 Southbound lane closure; A45 (London Road) Eastbound lane closure; A45 (Stonebridge) Eastbound lane closure; Rowley Road lane closure; Siskin Drive lane closure; A45 (Stonebridge) Eastbound lane closure; A45 (Stonebridge) Westbound lane closure. Friday 5 February - A46 Southbound lane closure; A45 (London Road) Eastbound lane closure; A45 (Stonebridge) Eastbound lane closure; Rowley Road lane closure; Siskin Drive lane closure; A45 (Stonebridge) Eastbound lane closure; A45 (Stonebridge) Westbound lane closure. Lane 4 closure on the A45 westbound. Narrow lanes will be in place on A45 Stonebridge Highway, westbound (Tollbar to Stivichall). Traffic management will be in place on Tollbar roundabout. Stonehouse Lane access to A45 Stonebridge Highway will be closed. Lane 1 closure will be in place on A45 London Road, eastbound. Narrow lanes will be in place on A46 Coventry eastern bypass, northbound. Rowley Road will have various lane closures. Siskin Drive will have various lane closures. London Road B4110 will have various lane closures. The carriageway will be closed from 2 to 7 February between 8pm and 6am. A diversion route will be clearly signposted. The carriageway will be closed southbound from 2 to 28 February between 10pm and 6am. A diversion route will be clearly signposted.